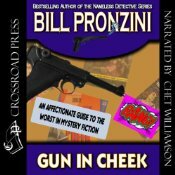 My narration of Bill Pronzini’s hilarious GUN IN CHEEK! One of the funniest books I ever read was Gun in Cheek by Bill Pronzini, an examination of really bad mystery fiction from the early part of the twentieth century. Filled with lengthy quotations from the works of “alternative genius” themselves, it was a yuckfest for readers and writers alike. So when I was asked if I wanted to narrate an unabridged audiobook of the title……how could I say no? It was an absolute joy to narrate, getting to read aloud all the dreadful prose that Pronzini collected, as well as the plummy and idiotic dialogue and make it all sound real and sincere. For hours of giggle-filled listening, may I suggest you hie thyself to Audible.com and check it out. Audible provides relatively inexpensive downloadable audiobooks — no paying fifty bucks for a set of CDs you’ll listen to one time. Audible memberships are cheap, and you get the audiobooks at a drastically reduced price. Put them on your iPod, iPhone, Kindle, Nook, or other magical devices. Believe me, you’ll have as much fun listening as I did reading it! Previous PostInterview with ME on Stephen Ormsby’s Blog…Next PostMy narration of SON of Gun in Cheek! Twice the funny!